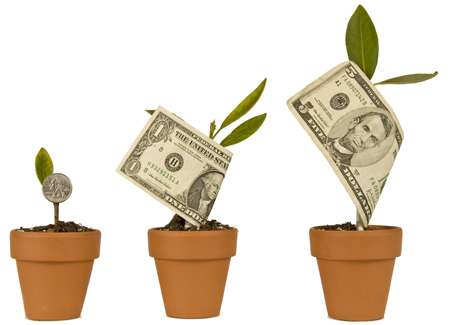 Making your money work for you is THE fundamental concept in wealth creation. Too many people save for something, or save for the sake of saving, but all this hard work is going to waste if you don’t make the money you keep work for you. Many people will tell you that putting your money in the bank is a great way to save and that by adding to it over time it will grow. Sure leaving it in the bank will work, but this is not really a great wealth creation strategy as the banks make their own rules. There are much better ways to go about making your money work a lot harder. The key to wealth creation is to tie your money up so it can’t get away. Banks are not a great place to keep your money as they become the ones who put it to work, but only give you a small amount in return. The only time I think it is worth leaving your money in a bank is if you are working towards a lump sum for an investment, you are afraid of debt of any type, or if it is the money you save (for something you want) and not the money you keep. Have a look at the ways the wealthy use their money, how many of them just sit their money in the bank? Not many! In fact, what most wealthy people do is act like banks. Have a think about what banks do, they take other peoples money and invest it. If you borrow money from them, then you pay an interest rate higher than the one you would get if you lent the money to them yourself – now that is how you make money! So how can you be a bank? There are lots of ways to do this, but it really comes down to your comfort level with debt. If your goal in life is never to be in debt, then keep your money in a bank or invest it in conservative managed funds and only utilise what you have saved. There is nothing wrong with this if it makes you happy and allows you a good nights sleep. If you are willing to allow some debt and know the difference between good debt and bad debt, then there are greater options available to you. Do you own or have you thought about owning a home? Most banks will give you money (up to 95% of the cost and sometimes more) to buy one. Why do they give you so much? Because they view it as a safe investment. A house is tangible and in most cases housing prices do not suffer from wild fluctuation, particularly if you do your homework and find the right one. But what if you bought a house and didn’t live in it? Let’s say you let someone else live in it and they paid you rent, this is a return on your investment. In addition to this, your property value might increase over time, which means it is now worth more than you paid for it and you have made money. On top of that the government might allow you a concession on your tax because of this investment. This is being a bank – in fact, you have flipped the roles and are now taking money from them to invest and paying them a small amount in return (the interest on the loan). Now you can do very similar things with stocks, shares and bonds but banks generally don’t lend you as much as they are not considered as safe as property. They are not tangible and are often subject to wild fluctuations. The same rules apply however and if you do your homework you can experience success in this investment strategy too. You get to be the bank by lending a company your money and they repay you by growing (and therefore increasing the value of your share), or by paying you a dividend, or preferably both! The most important rule to making money work for you is to seek out advice from those that are competent to give it. This doesn’t mean that you have to pay someone else to invest your money, just do your homework. You wouldn’t ask your butcher for advice on shares would you? So why would you take any notice of what someone else had to say if it wasn’t their business? How about property? Would you ask a real estate agent in Australia to give you advise on housing in America? It’s their profession isn’t it? Sure, but their knowledge only extends so far. You would be much better off seeking out a professional in the right country and more than that, in the right state or even suburb. This is targeted research and makes investing your money a lot safer and generally more profitable as the right advice will give you the best return. Always remember though that its your money, its your decision and you need to be comfortable before doing anything with it.